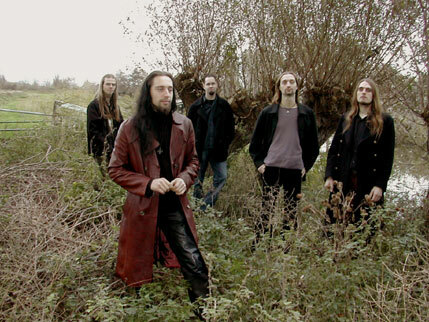 Eria d’Or is a metal band from Gorinchem, province of South-Holland, The Netherlands. The band has developed it selves strongly since its beginning in the winter of 1997/98. Now the band is matured with an own sound, lots of experience, three demo’s, an own rehearsal room and many successful shows. The band also played three times with inspiration Anathema in Amsterdam (Melkweg), Dordrecht (Bibelot) and Utrecht (Tivoli). Besides those venues, Eria d’Or also played in well known Dutch clubs like the 013 (Tilburg) and three times in the Baroeg (Rotterdam). Through the different musical influences off the band members an own sound is created which is difficult too categorize. When a definition has to be given, than “Melodic, atmospheric metal with doom and death influences” will suit. Inspired by bands like Opeth, My Dying Bride & Anathema, the sound of Eria d’Or has been developed. A equilibrium between quiet, romantic and loud, penetrating passages is present in the music of the band. The melody plays hereby always the central role. Through this interaction, which is sometimes achieved by abrupt breaks or sometimes by building up the tension through slow passages, the music never becomes boring and the listener is drawn into a story. Each songs has his own structure, resulting in a musical journey. The vocals are hereby equally important and are, just as the music, built up through different ways. Besides whispering and clean voice, a deep, heavy grunt and a penetrating scream are frequently used. The lyrics are an expression of feelings. Grief, happiness, hate, bewilderment and depression are placed, with a lot of fantasy, in a nearly unreal world. Although the band had a lot of positive reactions from the press, venue’s and public, the band is still not signed. Because of this Eria d’Or has to produce his own cd’s and promote the band by itself.